Week 7 is upon us, and it showed up in a big way. Last night, the Oakland Raiders scored a buzzer-beater touchdown to defeat the Kansas City Chiefs 31-30. There were a ton of fantasy points! Derek Carr and Alex Smith threw for over 700 yards, while Tyreek Hill caught a 64 (!) yard touchdown. And welcome back, Amari Cooper! Cooper came back with more yards than he had all season combined, catching 11 passes for 210 yards and a pair of scores. Hopefully, you started Coop! Let's look at what the rest of Week 7 has in store for us. Love 'Em: Kirk Cousins @ PHI - Kirk Cousins is heating up. Time to celebrate. He's scored over 75 points combined in his last three games and gets nearly the best matchup of those three games this week against the Philadelphia Eagles. Philadelphia is currently allowing the 10th most fantasy points to quarterbacks and has allowed 20+ fantasy points to QB's in three of their last four games. The Redskins are extremely banged up on offense, but somehow Kirk Cousins is still producing after a slow start to the season. Cousins is a top-7 play this week. Leave 'Em: Jameis Winston @ BUF - Winston sprained his AC joint early last week against the Cardinals, and many expected him to miss this week. However, he's been emphatic that he's playing against the Bills and began throwing late this week. Not ideal. Buffalo's defense is also very underrated, limiting quarterbacks to the third least points per week. There aren't enough positives to outweigh the negatives this week. Love 'Em: Adrian Peterson @ LAR - This one isn't too tough to figure out. Peterson was traded to the Arizona Cardinals early two weeks ago, and had a game nobody saw coming. He rushed 26 times for 134 yards and 2 touchdowns. It's unrealistic to believe Peterson can consistently do this, but he's got a good chance to repeat against an LA Rams defense allowing the most fantasy points per game to running backs. Peterson's a top-15 play this week with top-5 upside. Leave 'Em: Mike Gillislee vs. ATL - This is one of the few cases a player will appear and the matchup has nothing to do with it. Mike Gillislee will do well if he scores a touchdown, and he will not do well if he does not score. However, he never catches passes and never has many yards. I don't understand why I see Gillislee in lineups every single week. He hasn't rushed for above 70 yards all season and hasn't found the end zone since week 2. He fumbled Sunday, and in a Bill Belichick offense, that means you vanish into some unknown place that must be awful. Remember LeGarrette Blount's runs in the Super Bowl? Probably not, because he fumbled. "Touchdown Mike" Gillislee is turning into "Overrated Mike" very quickly. Love 'Em: Pierre Garcon vs. DAL - Every year, there's a wide receiver on a really bad offense that emerges as a good fantasy option. Thank you, negative game scripts. 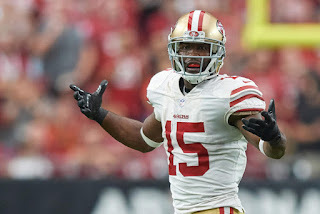 This year's guy is Pierre Garcon. San Francisco has lost every game this year, and Sunday will be no different against a Cowboys team that's had two weeks to prepare. The weakest link of the entire Cowboys team is the secondary, especially after losing so many pieces to other teams this free agency period. Garcon has capitalized on good matchups this year, scoring 14, 21, and 17 points against the Panthers, the Rams, and the Colts. Garcon is yet to score, so let's hope he hits paydirt this weekend. If not, he's still a top-18 play in PPR. Leave 'Em: TY Hilton vs. JAC - Hilton has done very well without Andrew Luck, better than I expected. But, those numbers are inflated by 2 150+ yard games against Cleveland and San Francisco. Outside of those, Hilton hasn't gone over 10 points in a game. Hilton gets Jacksonville's daunting secondary this week, who just haven't allowed a great performance all season. Though Chuck Pagano did say Hilton needs to see more targets, I really don't think Hilton should be in starting lineups this week. Love 'Em: Jimmy Graham @ NYG: Graham got off to a slow start to begin the season, but headed into his bye with at least 6 catches or 60 yards in 3 straight games. Seattle's had 2 weeks to prepare for the saints, and they've allowed more points than any other team in the league to tight ends. Graham is arguably the most talented piece in Seattle, and they're going to need to use him if they want to jumpstart a dissapointing offense. Leave 'Em: Jason Witten @ SF: Surprisingly enough, the 49ers are the best defense in the league when it comes to guarding TE's. They've yet to allow a touchdown, or 40 receiving yards to the lead tight end. This streak will break eventually, but I don't know if Jason Witten is the guy to do it. He started out the year with touchdowns in back to back games but has not gone over 70 receiving yards since. There are much better options than Witten out there.